Reaching out and providing spiritual and physical support is your mission. To maximize the outreach experience and provide the security needed in adverse surroundings, IMG offers several international medical plans tailored to meet the needs of mission-sending organizations, churches and missionaries. 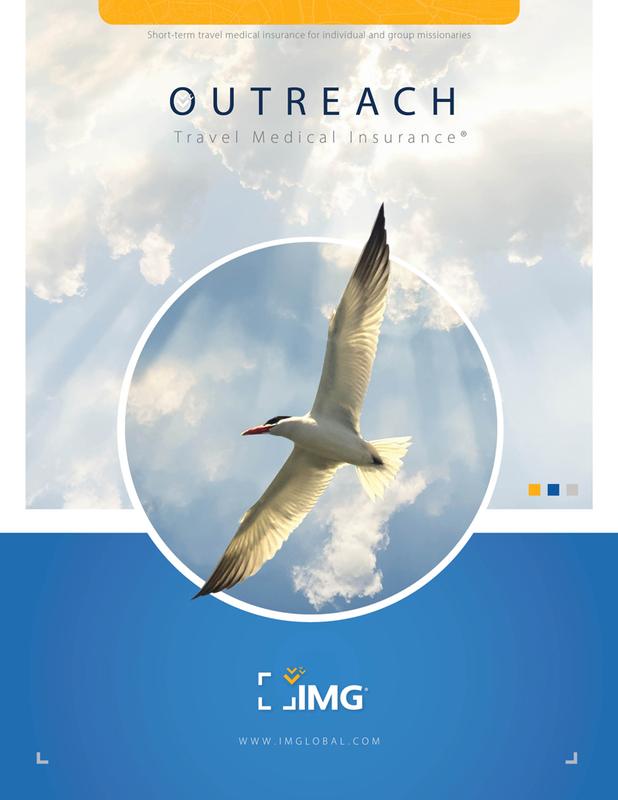 IMG wants to encourage your mission's success by providing comprehensive benefits, such as 24/7 assistance, emergency evacuations, repatriation, and trip cancellation protection. You have enough to worry about when you're traveling. Don't let your medical coverage be an uncertainty. 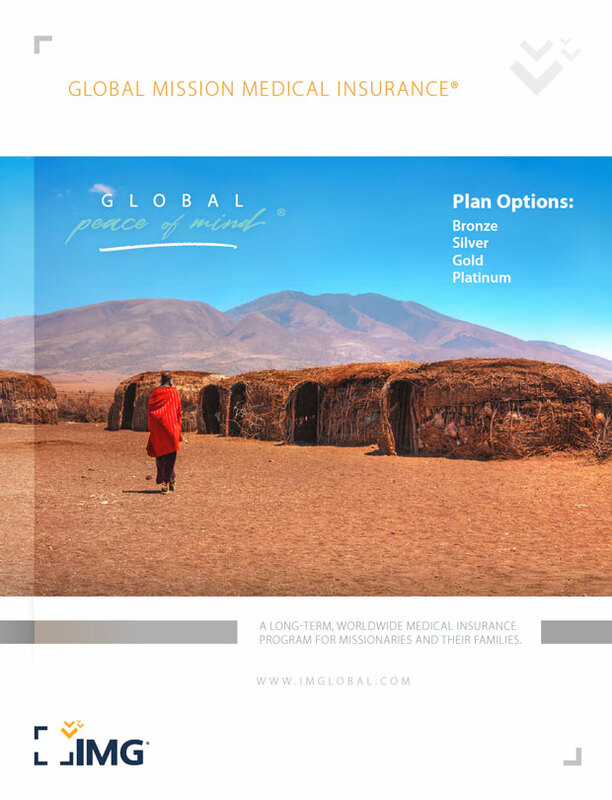 Learn more about IMG's plans for small or large mission groups, short or long term, and get Global Peace of Mind®. NA $70 maximum per visit, 3 visit limit per period of coverage. Not subject to deductible or coinsurance. $200 maximum per period of coverage - not subject to deductible or coinsurance. $400 maximum per period of coverage - not subject to deductible or coinsurance. Injury due to an accident: Each Outreach plan covers the cost of emergency dental treatment and dental surgical procedures necessary to restore or replace sound natural teeth lost or damaged in an accident up to the Maximum Limit. Each plan pays $100 directly to the insured person for each night of a required overnight stay in a hospital up to a maximum of 10 days. The hospital stay must be covered under this plan in order to receive this benefit. This benefit is not available for Outreach America (non-U.S. citizens) if the hospitalization is due to the Sudden Recurrence of a Pre-existing Condition. The Outreach plans offer coverage for Emergency Medical Evacuation to the nearest qualified medical facility; expenses for reasonable transportation resulting from the evacuation; and the cost of returning to either the home country or the country where the evacuation occurred, up to $500,000. Each Outreach plan also offers Emergency Reunion coverage, up to $50,000 for a maximum of 15 days, for the reasonable travel and lodging expenses of a relative or friend during an Emergency Medical Evacuation: either the cost of accompanying the insured during the evacuation or traveling from the home country to be reunited with the insured. If a covered illness/injury results in a hospitalization and/or death and the insured person is traveling alone with child(ren) 19 or under that otherwise would be left unattended, the Outreach plans will pay up to $50,000 for one way economy fare to their home country, including a chaperone, if necessary, for the safety of the child(ren). If an imposter obtains key personal information such as a Social Security or Driver's License number, or other method of identifying an insured person in order to impersonate or obtain credit, merchandise or services in the insured person’s name, the Outreach plans provide coverage for up to $500 for the reasonable, customary and necessary costs incurred by the insured for: re-filing a loan or other credit application that is rejected solely as a result of the stolen identity event; notarization of legal documents, long-distance telephone calls, and postage that has resulted solely as a result of reporting, amending and/or rectifying records as a result of the stolen identity event; up to three credit reports obtained within one year of the insured person’s knowledge of the stolen identity event; and stop payment orders placed on missing or unauthorized checks as a result of the stolen identity event. Each Outreach plan provides coverage for injuries and illness incurred as a result of an act of Terrorism, limited in amount and by circumstances. If an insured person is injured as a result of an act of Terrorism, and the insured person has no direct or indirect participation in the act, the plan reimburses eligible medical claims subject to a $50,000 lifetime maximum. Terrorism includes criminal acts, including against civilians, committed with the intent to cause death or serious bodily injury, or taking of hostages, with the purpose to provide a state of terror in the general public or in a group of persons or particular persons, intimidate a population, or compel a government of international organization to do or to abstain from doing an act. However, this benefit does not cover an act of Terrorism in any country or location where the United States government has issued a travel advisory that has been in effect within the six months prior to the insured person's date of arrival. However, claims incurred as a result of radiological, nuclear, chemical or biological weapons or events are not covered. Each Outreach plan covers injuries incurred during athletic activities which are non-organized, non-contact and engaged in by the insured person solely for leisure, recreation, entertainment or fitness purposes. Some of these sports and activities include, but are not limited to, motor cycle/motorscooter riding, recreational downhill and/or cross country snow skiing, horseback riding, sub-aquatic activities (to 10m), wakeboarding, and water skiing. However, activities not covered include amateur or professional sports or other athletic activity which is organized and/orsanctioned by the National Collegiate Athletic Association (and/or any other collegiate sanctioning or government body), or the International Olympic Committee, and or Adventure Sports. (Non-U.S. citizens only) For those under age 65, Outreach America will pay up to a $50,000 lifetime maximum for eligible medical expenses. For those age 65 and older, Outreach America will pay up to $2,500 lifetime maximum. If, during a covered trip, there is an unexpected death of an immediate family member (spouse, child, parent or sibling), a break-in at the insured’s principle residence, or the substantial destruction of the insured’s principal residence due to a fire or natural disaster, each Outreach plan pays to return the insured to the area of principal residence. The plan pays for a one way air or ground transportation ticket of the same class as the unused travel ticket, less the value of the unused return ticket. The following benefits are offered to eligible insureds. The plan covers charges for Eligible Medical Expenses within the area of coverage. All amounts shown are in U.S. dollars. Emergency Room Deductible An additional Deductible of $250 will be applied for each emergency room visit for treatment of an Illness which does not result in inpatient status. Mental or Nervous Disorders Outpatient Treatment: 50% of Eligible Medical Expenses and maximum of 40 visits per Insured Person per Calendar Year. Hospital Indemnity Benefit Outside of the U.S.
Why Do I Need Mission Trip Insurance? It’s important to consider that your own domestic health insurance may not cover you outside of your home country. Depending on your destination, local medical facilities may require proof of insurance before they administer any treatment, or they may not have the resources to treat you properly, thus requiring a medical evacuation. While many churches and mission groups take care of a majority of the arrangements for your trip, you should make sure you understand the basics of your insurance plan before you leave. IMG has built trusted relationships with missionary organizations since 1990 and can offer you the protection you need. How Much Does Mission Trip Insurance Cost? Our short-term missionary insurance plans are designed for individuals and groups. These plans average around $2.00 per day for all ages (based on trip length and benefit levels). We also offer insurance options for long-term coverage ideal for career missionaries that vary in price depending on your age and health. What types of trips qualify for Mission Insurance? According to a Globus Religious Travel Study, over 16 million people plan on taking a religious-affiliated trip at some point in their life. Nearly half of them will book that trip through their church, which makes up the most common type of trip that qualifies for mission insurance: a short-term trip with a faith based group in effort to spread awareness. Sometimes people are driven into action by the unexpected. Disaster relief trips are a great way to contribute to a time-sensitive cause that may hit close to home. For those seeking to help a cause without a religious affiliation, social good trips are an excellent choice. Social good trips may offer a vacation, while also including a rewarding volunteer experience. These trips are often available through non-profit organizations. Mission trips have evolved into many niches over the years, allowing you to find a trip that fits your needs. Some examples include gap year mission trips, adult mission trips, world races, and many more. What Does Mission Trip Insurance Cover? Provides coverage if you need to return home from your trip early due to covered reasons such as a death of an immediate family member. This benefit can provide cover for an emergency medical evacuation to the nearest qualified medical facility, expenses for transportation resulting from the evacuation, and the cost of returning the insured to either their home country or the country where the evacuation occurred. Mother Nature has a mind of her own. This benefit can cover you if you are displaced due to an event such as an earthquake, hurricane, tsunami or tornado. If you were to fall ill or injured during your mission trip, this benefit could help cover the expenses for medical care. International Medical Group® (IMG®) has earned a reputation for excellence and dependability within the missionary community. Each year, IMG hosts an essay contest as our way of giving back. The global outreach essay contest offers mission organizations a chance to win $5,000. Get more information about the contest and read about last year’s winners here! Am I getting the best deal on these plans? Insurance prices are regulated by the government - you won't find a better price on IMG insurance plans anywhere else. What should I do if the worst happens and I need to go to a hospital while on a mission Trip? IMG plans provide you access to more than 17,000 providers through our International Provider Access (IPA) while you're outside of the United States. Our multilingual customer service centers, claims administrators, and 24-hour emergency care coordinators are ready if the unforeseen does happen during your mission trip. What mission focused benefits are included in these plans? In addition to the medical and health coverage, healthcare provider access, and other benefits you expect from IMG plans, we offer missionary-specific insurance benefits like coverage for furlough and political evacuations. See your plan befits information for more! How long does it take to process my application and receive my ID card and other documents? If you are applying for coverage under the Patriot series of plans, IMG will process your application and send your ID card and other documents within one business day. If you are applying for coverage under the Global or Group series, IMG will process your application within three to four business days following the receipt of all required information, and your materials will be forwarded the same day coverage is approved. Every attempt will be made to process your application timely. The specific time frame depends largely on the type of coverage for which you are applying. This is not an offer to enter into an insurance contract. This is only a summary and shall not bind the company or require the company to offer or write any insurance at any particular rate or to any particular group or individual. The information on this page does and will not affect, modify or supersede in any way the policy, certificate of insurance and governing policy documents (together the "Insurance Contract"). The actual rates and benefits are governed by the Insurance Contract and nothing else. Benefits are subject to exclusions and limitations.